What is the Sun Savers app? Sun Savers App is the new reward app from the Sun. Using this app, you will be able to earn cashback when you collect the unique code which is printed in The Sun Newspaper every day. All you need to do is just collect the 28 codes and the app will give you £5 free. Each day you get to see unique codes which are printed in The Sun Newspaper. And what you need to do? Simply scan or type the code from your paper into the app. Every time you collect around 28 codes the app pays you £5 into your Sun Wallet. You can transfer this money to your PayPal account or your personal bank account at any time and all this happens via the app. Plus, you also get the priority access to your favorite Sun promotions which include Hols from £9.50 and Super days. 2 What do you have to do for the Sun Savers App? 3 How can you redeem your money from the Sun Savers App? 4 What are the features of the Sun Savers App? 5 How to Download and Install the Sun Savers App? The Sun created the Sun Savers to put a fiver in the readers’ pockets every month, so that they are able to spend or save up for whatever they want: that top you have had your eye on, a family meal out or maybe a treat at Christmas, now you will find that all these possibilities are endless. Also, the best part of the app is that you will be earning for nothing or rather we can say for doing what you have already been already doing – no catches, forms to fill in or hoops to jump through. Whenever you buy the paper, all you need to do is scan the code and once you have scanned 28, a fiver is yours to cash out or save up. Doesn’t it sound great? But Sun Savers is more than just a fiver a month, it is also actually a club for the people who want to get the most from life. You will also get exclusive access to your favourite Sun promotions, including early access to book your Holidays From £9.50 and also your pick of Super days dates. And that is not it! You can also get tips, tricks and life hacks for how to make your money go further and live well for less from The Sun team and the other members of the Savers community. What do you have to do for the Sun Savers App? The answer is quite simple. Join the Sun Savers via the Sun Savers site or just download the super quick and easy app from your iOS or Android app store and register there. After you have done with this, just continue reading your favourite paper and entering the unique codes using our app or website. The Sun Savers will then tally up your codes and once you have reached 28, you will have a real fiver to do with what you wish. Also, you do not have to worry if you miss a day or two because you don’t have to add them consecutively. But just remember one thing, make sure that you add your code within five weeks, or it will expire. Plus, the more codes you enter the more cash you earn! You will also find your unique code printed in The Sun newspaper every day. You just need to look out for the Sun Savers page for your code and earn great savings tips. 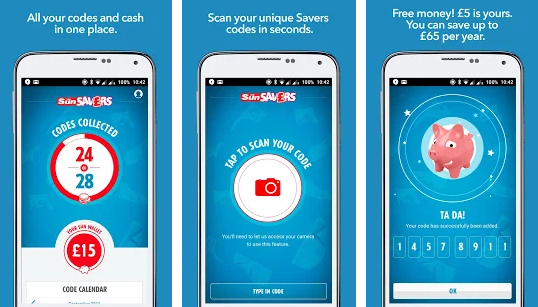 How can you redeem your money from the Sun Savers App? The method to redeem your cash is quite simple. You can get your cash by transferring it straight to your bank account or to your Paypal account. It will take up to 3-5 working days before the cash is transferred in your account, or instantly with PayPal. You can also track your recent activity, codes and rewards in your personal calendar which you can access from the app or the Sun Savers website. What are the features of the Sun Savers App? £5 cash is transferred straight to your account. You keep getting surprise & delight bonus codes. It is the easiest way to save or cash out your money – it’s totally your choice. You can book and pay for your Sun Holiday. You can also follow your progress with the handy code counter. You also get to choose your dates for Super days. Your code calendar will make sure that you never miss a day. How to Download and Install the Sun Savers App? The Sun Savers App is available on the Google Play Store and also on the APP Store for free. So, both the Android and the App Store users can download the app easily from their respective stores and start using it. It is very simple and easy to become a member. You can either join the Sun Savers via the Sun Savers site or download their quick and easy app from your iOS or Android app store and get registered there. Yes. There are no cost or hidden costs to get involved. But yes, you do need to purchase the Sun newspaper to collect and scan your unique Sun code – of course. You will find your unique code which will be printed in the Sun newspaper every day and it will contain a mix of letters and numbers. Every day you will be able to find the unique code which you find on the Sun Savers page inside the paper. As already said, the Sun Savers give you £5 for every 28 unique codes you have entered. Once you have entered a total of 28 codes, you can claim your cash by clicking on the ‘cash out’ button in the app. You will also need to add your bank details, or you can link your PayPal. Once this is done, you can find the cash transferred into your account which can take up to 3-5 working days before the cash is in your account, or instantly with PayPal.